Back in April, we introduced you to Vudu, the hybrid peer-to-peer video-on-demand box with all 7 major studios on board, is coming soon to a home theater near you. Today we got to play around with it a little more, and see how the navigation works. Since Vudu makes every box and knows their exact capabilities, as well as all of the content coming and going, the "load-sharing" distribution will be easier to manage than a Joost-type PC based service. Vudu stores the most popular movies throughout the network using a predictive system to speed up delivery. 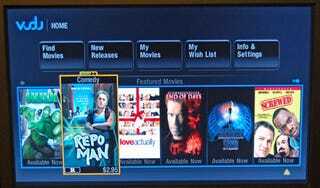 On your home network, any background data sharing will have a low priority over the other internet activities, but when you kick on the Vudu and demand content, it takes your router's center stage. The actual product announcement, including movie availability details, will happen later this summer, though we are told it will definitely ship this year, and for a price somewhere under $500. You will be able to buy or rent movies: 99 cents to $3.99 per rental; $4.99 to $19.99 per purchased movie, which will reside on the Vudu box and nowhere else. Vudu promises to let you download a purchased movie again, in the event of a hard-drive failure or some other catastrophe.